Next time you are browsing your local farmers market, pick up some beautiful greens from your favorite vendor. Try something new like mustard greens, beet greens, kale, or dandelion greens. This recipe is a great way to serve some of these lovely leafy greens in a new way. 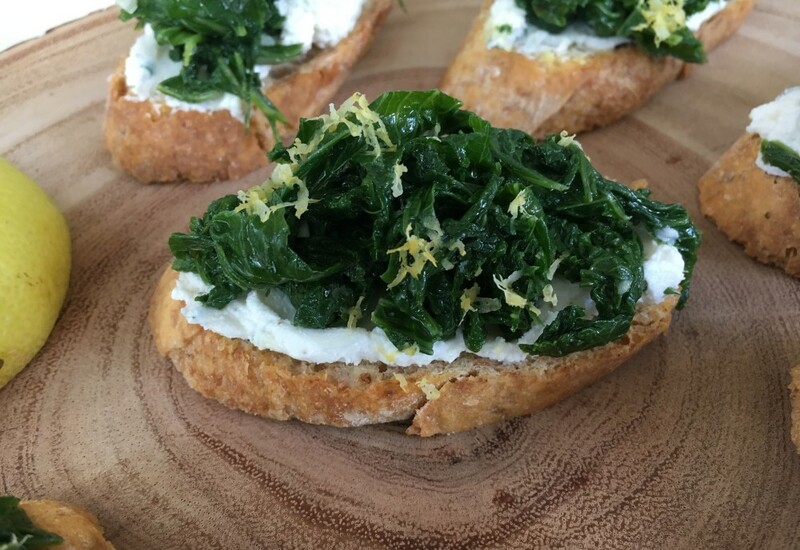 The greens are wilted with olive oil and garlic and then served over toasted crostini with lemony herbed goat cheese. It is delicious as an appetizer or a savory side dish. Finish with a little extra lemon zest for stunning presentation! Save time by toasting the crostini ahead of time and preparing the herbed goat cheese a few hours in advance. You can prep it in the morning, and snack on it all day and leave the chips on the shelves. Per Serving: 129 calories; 4g fat; 18.9g carbohydrates; 5g protein; 1mg cholesterol; 247mg sodium. We made these for appetizers at one of our get togethers with a few close friends. They were pretty popular. Everyone loved the garlic in the greens, and the goat cheese too. Delicious baguette with garlic greens! I made this for a holiday party at my job and everyone loved it! I had the goat cheese on the side so people could arrange them as desired. Such a good appetizer dish.